One of the problems plaguing public transport in Victoria is the secrecy. Historically the Department of Transport has kept its cards very close to its chest. There’s a lack of information, and a lack of consulation. Mr BARBER — I think your evidence is quite clear — despite being seasoned observers of Melbourne’s public transport system, you guys are telling us you do not really understand how the government is going about planning public transport for the future. Would that be a fair summary of what you have been telling us this morning? Mr BOWEN — If it is going on to a high degree, it is invisible to us, yes. 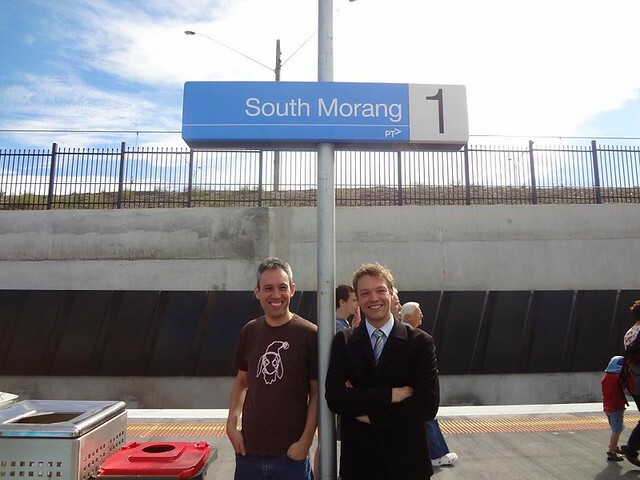 To this day, many people think that the South Morang rail extension was $562 million for a simple 3.5 kilometre rail extension along an existing reservation. There was more to it than that. Around that time, I remember that myself and PTUA Treasurer Kerryn Wilmot went to meet with the project manager. He expressed surprise that people were unaware of the full scope of the project. We told him that it was simply the case that nobody from the Department of Transport (DOT) had told anybody what was really going on. All the public information being put out by DOT’s public affairs people at the time was extremely vague. What other conclusion could people come to other than that DOT was paying ridiculous sums of money for a few kilometres of track along an existing alignment? As I subsequently noted in this post on the Transport Textbook blog, there was actually a lot included in the project, including some major bridges and grade separation (in other words, big changes to the existing alignment), duplication of part of the existing line, two entirely new railway stations (Epping and South Morang, the latter with a big car park) and rebuilding of station buildings at Thomastown, electrical substations, communications systems, parallel bike/walking paths, extra stabling, and re-signalling most of the way down to Clifton Hill and on the neighbouring Hurstbridge line. In short, it was a wholesale upgrade of two rail lines, and (arguably) a bunch of catch-up maintenance, as well as the short rail extension. It was only well after this that DOT bothered to put this information out in the public arena, but it was too late — many had already got the impression that this simple project was way over-priced, and that DOT and the government had no idea what they were doing. Some things have gone right with the project. It was thoroughly welcomed by the local community, completed early, and was wisely timed to include changes to local buses to re-focus routes around the new station. But even that has gone sour, with local residents campaigning against some of the changes, saying they were not consulted with, or informed. Likewise, when one PTUA member complained about his local bus route regularly getting caught in traffic, and asked what was being done about it, he was basically told DOT were talking to the bus company, but they couldn’t and wouldn’t be informing the public of any progress. And one final example: In June PTV posted a (very welcome) list of upcoming tram and train closures so people could plan ahead. But the recent near-complete shutdown of the Glen Waverley line was not mentioned until much closer to the date. If the upcoming works list isn’t complete, that rather defeats the purpose doesn’t it? Vancouver. Over there, the transport agency Translink has a number of communication channels with the public, including public Annual General Meetings, regular consultations, their magazine The Buzzer, and its accompanying blog. The blog has reports from the various parts of Translink, including Q+A with the CEO, route changes, and summaries from the AGMs. A Buzzer article from a few days ago talks in detail about how Translink designs their routes. This stuff is a goldmine of information. Of course, PTV (formerly DOT/Metlink) in Melbourne posts route and service changes on their web site, but Translink go a long way beyond that. The posts are open for comments so people can offer their points of view, and their blogger actually goes away and makes enquiries on behalf of commenters to help answer their questions. This post specifically caught my eye: it summarises new legislation designed to fight fare evasion, as well as tweaks to Translink’s structure and reporting, and links to past posts on these topics. The post and comments try to explain some of the thinking behind the legislation changes, giving those reading a better understanding of what’s going on. It’s a stark contrast to the recent Melbourne changes that have allowed limited sharing of Myki cards, but have not been publicised at all. Another page on Translink’s web site goes into detail on individual bus route efficiency (even down to things like measuring costs per passenger). In Portland, Oregon, the public transport authority Tri-met recently offered an online tool to let people see how budget cuts were affecting their operations, and offer their opinion on how it should be dealt with. The tool let people click around and try different measures to meet the defecit, such as fare increases, changing fare rules, removing a free fare zone, cutting services, and so on. It wasn’t perfect, but it’s the sort of thing that can not only let people make their views known, but also ensure they are aware there are real constraints and not a bottomless bucket of money for transport. More openness is what’s needed. Proactively volunteering information about what’s planned, what’s happening and why, responding to questions without spin, and actively getting feedback (not just waiting for people to be annoyed enough to complain). True, there has been some progress. Yarra Trams have recently got a lot better at responding to queries on Twitter, and one of their customer service people recently gained fame for responding to a customer email complaint informatively and with good humour. They’ve also got quite a good web page flagging upcoming track works. And true, some members of the public have been able to ask questions of Public Transport Victoria chief Ian Dobbs recently on talkback radio and at the recent PTUA Member Meeting. But this kind of direct contact and accountability needs to be more than just the CEO running himself ragged going to public/semi-public meetings. It needs to be commonplace throughout PTV and the associated agencies and organisations, including operators. And it needs to be genuine consultation — not just telling people how things are, but letting them participate in the planning process. 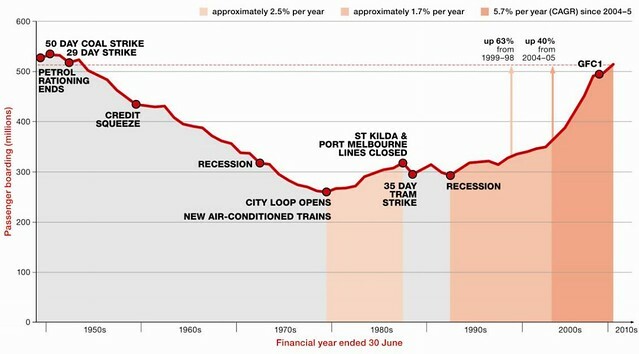 The other big positive change is that PTV have started publishing documents that previously have not been for public distribution, such as these documents relating to the proposed Metro rail tunnel and this study of long-term patronage trends from 1946-2011. But these documents are often highly technical, and very difficult to read. Unlike the example of Vancouver, there’s no explanations of much of the jargon, nor highlighting the sections that will be of particular interest to people, and why, and no public avenue for questions or two-way discussion. This post has rambled a bit, but I’ll try and reach some kind of conclusion. Ironically, when bloggers write about the true scope of the South Morang project, mentioned above, rather than link to the official DOT page, they’re more likely to cite the Transport Textbook post. Ditto, I see regular links pop up to my blog post which published station-by-station patronage figures. People do want information about how the public transport network is being planned, and how their (taxpayer) money is being spent. It helps inform debate and discussion. Social media such as blogs and Twitter can help; public meetings can help; radio talkback can help — just being more open can help. The more people are offered the chance to voice their opinions and concern, the more they’ll feel involved in the way the system’s run, and who knows, all those ideas might also result in a better transport network. There are so many “simple” rail projects, like grade separation at major bottlenecks, that apparently can’t be done because of huge cost. And yet contractors go out of business (Ararat gaol) or lose bucket loads of money (desal plant) despite the high price-tag. Perhaps workers are being paid too much? Or are material (concrete, steel) costs over-priced? Who knows? I completely agree. I’m not sure why, but the default position of the organisations involved seems to be completely defensive; they seem to assume any information will lead to bad press. I’m not sure how much of this is driven from the government of the day; it seems generally they like to control the flow of information, and make sure it’s on-message. Perhaps that’s part of the problem. Both sides of politics have more or less ignored the idea of freedom of information when in government, and generally seek to hide as much as possible. I would love it if Metro had a blog where they could talk about all the small things they’re changing, or how they’re improving the system; ideas they’re looking at etc. Similar with Myki, which is actually improving, but no-one’s talking about how it’s improving (or why). Good point about the lack of openness. This is our transport system and we should be able to have a say in the planning process. Maybe if things had been more open the past, we might have expressed an opinion on two door train carriages or fixed wheel trams and such mistakes might not have been made. And someone might have picked up the air conditioning units fitted to the new, older, Adelaide trams was below specification for what was needed in Adelaide, and the costly retrofit would have been avoided.